(Francisco Kjolseth | The Salt Lake Tribune) BYU quarterback Tanner Mangum runs through drills as the team opens preseason training camp on their practice field on Thursday, Aug. 2, 2018. Provo • The worst kept secret in Provo was officially let out of the bag on Monday. BYU’s great quarterback derby of 2018 is now down to two candidates: senior Tanner Mangum and freshman Zach Wilson. 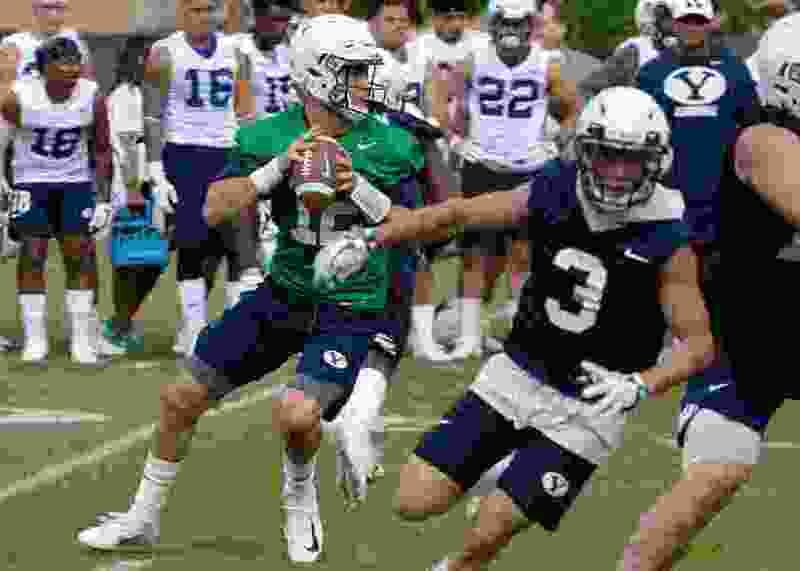 The youngest and oldest of the contestants for the starting job when the Cougars open against Arizona on Sept. 1 have separated themselves for quite some time now, and solidified that feeling among the coaches with their play in Saturday’s closed scrimmage. Grimes said the two other quarterbacks in the race, sophomore Joe Critchlow and freshman returned missionary Jaren Hall, are neck and neck for the No. 3 spot on the depth chart. Hall “has done some really nice things, and Joe has, too. He’s just been outperformed by those other two guys,” Grimes said. Quarterbacks coach and passing game coordinator Aaron Roderick said both Mangum and Wilson were 16 of 21 throwing the football Saturday. More importantly, none of the quarterbacks committed a turnover. Asked if coaches have a target date to name a starter, Grimes laughed and said Sept. 1. Last Friday, Roderick hinted that coaches may not announce a starter until kickoff in an attempt to keep Arizona guessing. Mangum and Wilson are quite different, with Mangum having the experience and pocket presence, and Wilson more dynamic and mobile. Wilson took off with the ball several times in Monday’s team session at the end of practice, showing off the wheels that helped him gain nearly 800 yards on the ground last fall at Corner Canyon High in Draper. Moving forward, Roderick said the fact that Wilson is just a freshman who was playing high school ball at this time last year will have no bearing on the decision. Mangum said “nothing changes” in the way he approaches every day despite being in the final two.